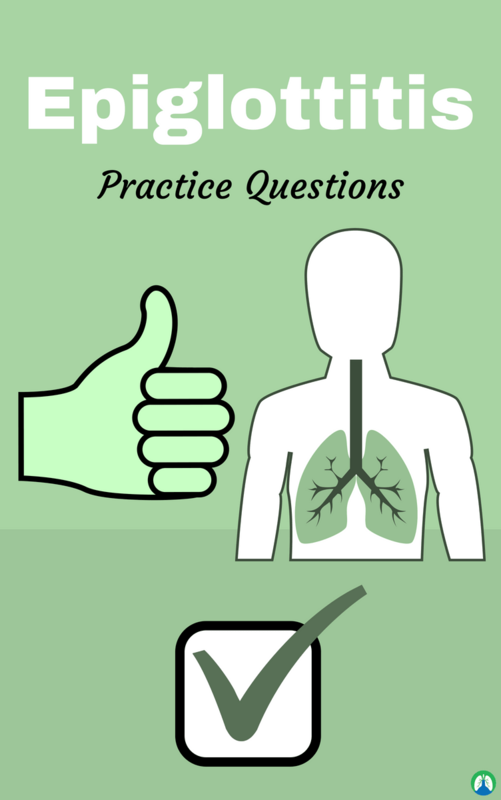 This article is loaded with helpful Epiglottitis practice questions (designed for Respiratory Therapy students), so if that is what you are looking for then you’ve come to the right place. Epiglottitis is definitely a condition that you must know as a Respiratory Therapist. It’s important to go ahead and learn the ins and outs now, while you’re a student, because this information is required of you for your exams in school, as well as the board exams too. So let’s go ahead and get started! It is an infection of the epiglottis and is a medical emergency. It can be caused by a virus or bacteria. It is most common in children aged 2-7. A key to remember this condition is that the swelling is ABOVE the glottis. Croup, on the other hand, shows swelling BELOW the glottis. That is how you know the difference between the two. 2. What vaccine has helped decrease the incidence of epiglottitis in children? HiB (haemophilus influenzae type b). 3. What is the clinical presentation of epiglottitis? Sudden onset of fever, respiratory distress, severe dysphagia, drooling, muffled voice, mild stridor with little or no coughing and tripoding. 4. What are the diagnostic studies for epiglottitis? Direct visualization with caution because it may be fatal in children, CBC and blood cultures, and a lateral neck x-ray. 5. What is the classic x-ray finding with epiglottitis? There will be a thumbprint sign in epiglottis. This is one of the keys to remembering this condition. Croup, on the other hand, will show a steeple sign. 6. How can you manage epiglottitis? As a Respiratory Therapy, our main job will be to secure the airway. 7. How do you differentiate croup from epiglottitis? 8. Why do 2 to 4-year-olds get epiglottitis most commonly? The shape of their epiglottis is more omega-shaped than the adult “u” shape. 9. What are the signs and symptoms of epiglottitis? There will be a sudden onset of inflammation somewhere along the glottis. There is obstruction of the airway and that leads to distal mucus plugging and respiratory distress. The child will be drooling, may have loss of voice, and will immediately go to the tripod position to try to ease their breathing. 10. What are the most common causes of epiglottitis? The most common cause is bacterial. Bacterial includes non-typical which are haemophilius influenza (used to be Type B but we have the HiB vaccine for that now) and strep pneumonia (so this one is flipped from other URI’s); and, non-bacterial that is acquired by drinking really hot coffee/thermal or chemical injury. 11. Why is it important to not want to examine the throat of patients that have epiglottitis? Patients already feel the AIR RAID symptoms, so sticking something down their throat may cause even more anxiety. The patient must be relaxed. Do not use a tongue blade and do not give anything to drink. 12. What airway sound will you hear on patients with epiglottitis? Stridor (upper respiratory sound that leads to airway obstruction). 13. What treatment is done for epiglottitis patients? The inflammation will resolve on its own. Make sure the patient can calm down and help assist them in breathing. Give a cool mist to spray in their throat, or some oxygen. An endotracheal tube should be nearby just in case the airway does not open up. Help them breathe until it is better and goes away. 14. What is the inflammation of the epiglottis and adjacent supraglottic structures? 15. What will the throat of an epiglottitis patient look like? 16. What does epiglottitis require? Immediate attention because the inflamed tissue can block the airway. 17. What is a predisposing factor of epiglottitis? 18. Where is the source of the pathogens in epiglottitis usually from? 19. From what ages does epiglottitis mainly occurs in children? 2 to 7 years old. 20. What vaccine has helped eliminate a lot of the epiglottitis cases? Hib (hamafelus influenza type B) vaccine. 21. What are the risk factors for epiglottitis? Lack/incomplete immunization or immunodeficiency, immune deficiency and children 2 to 7 years old. 22. What can be infected by epiglottis? Bacteria, viruses, or fungal pathogens but is most often infected by Hib (even if immunized). Other bacterial pathogens include: streptococcus pyogenes, streptococcus pneumoniae, and staphylococcus aureus. 23. What are the characteristics of epiglottitis in young children who are unimmunized/under-immunized? Respiratory distress, tripod position, stridor, anxiety, sore throat, dysphagia, drooling, fever, and neck tenderness. 24. Who is susceptible to a severe sore throat seen with epiglottitis? 25. What confirms the diagnosis of epiglottitis? An endoscopy to view the cherry red epiglottis. 26. What will be seen on laryngoscope? 27. On the lateral radiograph, what sign indicates epiglottitis and is due to the swollen tissues around the epiglottis? The presence of a thumb sign. 28. When can a lateral radiograph be done? When there is no emergency and to exclude foreign bodies. 29. What is the number one main focus of treatment for epiglottitis? 30. What is the other treatment of epiglottitis? Empiric therapy with coverage of the most common causes (including MRSA). 31. What are some clinical signs can be seen in children with epiglottitis? Tripod posture (trunk leaning forward, neck hyperextended, chin forward), anxious, prefers to sit, sniffling position to maximize patency of airway, fever, respiratory distress, dysphagia, and drooling. 32. What would the epiglottis look like in epiglottitis? Inflamed, swollen, cherry-red, tissue can block the airway, erythematous, and edematous. 33. What types of pathogens can cause epiglottitis? H. Influenza type B is the most common cause overall, even in immunized children and adults. 34. What type of pathogen is a concern for epiglottitis in patients who are immunocompromised? 35. What are the non-infectious causes of epiglottitis? Trauma by foreign objects, inhalation and chemical burns, other diagnosis, reactions to chemotherapy and inhalation of heated objects when smoking illicit drugs. 36. Which age group gets epiglottitis most often? Children aged 2-7 years old, but it may occur at any age. 37. What is the most common cause of acute epiglottitis? Haemophilus influenzae type B but the use of immunization has reduced this. 38. What are some of the organisms that cause epiglottitis? Streptococcus pyogenes (group A), streptococcus pneumoniae, non-typable haemophilus influenzae, and staphylococcus. 39. What is the most common presentation of epiglottitis in adults? 40. How does epiglottis present? Child looks toxic and swallowing is difficult. High fever, sore throat, dyspnea, rapidly progressive respiratory obstruction and tripoding. Drooling is usually present and the neck is hyperextended. The degree of respiratory distress varies. Note that the respiratory distress may be absent initially or it can be the first manifestation. Stridor is a late finding and suggests almost complete airway obstruction. Call for help. 41. What are the four Ds of epiglottitis? Drooling, dysphagia, distress, and dysphonia. 42. What is the tripod position? The child sits forward supported by both hands, the neck is extended and the chin is out. 43. Why may the neck be hyperextended in a child with epiglottitis? This is an attempt to maintain the airway. 44. How do you diagnose epiglottitis? Doing a laryngoscopy under controlled circumstances (OT or ICU) – you should see a large cherry red and swollen epiglottitis. Sometimes the aryepiglottic folds are more involved than the epiglottis. Call for help! 45. What is the outline of the management of epiglottitis based on the stability of the airway? If they are unstable, that is, unreactive, cyanotic and bradycardic, then intubate right away. If they are stable with a high suspicion then take to OT for laryngoscopy and intubate under GA. If they are stable with moderate to low suspicion, obtain a lateral neck x-ray. 46. When do you do a laryngoscopy if the diagnosis of epiglottitis is certain or probable based on clinical findings? Immediately but in a controlled environment. Other procedures like IVA should be avoided until the airway is secured, because this aggravates the child leading to more obstruction. Call for help. 47. Do you intubate a patient with probable epiglottitis first? No, get a lateral neck x-ray to confirm. 48. What does the classic radiograph of the child with epiglottitis show? The thumb sign. Make sure the child is properly positioned and adequate hyperextension of the neck and head is necessary. 49. What is done next if the lateral neck x-ray shows that epiglottitis is present? Direct visualization is needed. Always be prepared to intubate the patient. 50. What patients with epiglottitis should be intubated? All, regardless of degree of respiratory distress. 51. How long should the patient with epiglottitis be intubated for? It depends on the clinical course and the duration of epiglottic swelling as determined by laryngoscopy. Most children are intubated for 2-3 days because the response to antibiotics is rapid. 52. What is the definitive treatment of epiglottitis? Intubation in a controlled environment. 53. What is done in epiglottitis while going to the hospital? Oxygen should be given unless it excessive agitation. 54. Do racemic epinephrine and corticosteroids have a role in epiglottitis? No. These are not effective. 55. What investigations should be done in epiglottitis? After you have stabilized the airway (intubated), a blood culture, epiglottic surface culture, and in some cases CSF. 56. What is the empirical treatment of epiglottitis pending cultures? Cefotaxime, ceftriaxone or meropenem parenterally. 57. What can be expected after intubating a child with epiglottitis? There should be an immediate improvement; respiratory distress and cyanosis should be resolved. 58. Can epiglottitis be resolved after a few days of antibiotics? Yes, the patient can be extubated but antibiotics are continued for a total of 10 days. 59. How do you know that the epiglottic swelling is resolving? It has been confirmed by visualization, usually with fiber-optic laryngoscopy. 60. Is prophylaxis needed in the surroundings and contacts of a child with epiglottitis? 61. What contacts of a child with epiglottitis will get rifampin prophylaxis? Where a child is less than 4 years and is incompletely immunized, or the child is younger than 12 and has not completed the primary vaccination series or is immune competent. 62. How do you manage acute laryngeal swelling due to allergies? Epinephrine IM or racemic. Corticosteroids can be used. Discharge the patient with a syringe of epinephrine. 63. What is the number one danger of epiglottitis? 64. What organism causes epiglottitis? 65. What level of fever is present in epiglottitis? 66. What are the classic symptoms of epiglottitis? A muffled voice, drooling, and stridor. 67. Will the child with epiglottitis cough? No, they have a lack of a spontaneous cough. 68. How will the child with epiglottitis breathe? Leaned forward with flaring nostrils. 69. Should you use a tongue depressor to look in the child’s mouth? No, never put anything in their mouth unless immediate intubation. 70. What drugs are used to fight epiglottitis? 71. What behavior indicates the need for tracheotomy? Restlessness, increased heart rate, and retractions. 72. What is recommended to prevent epiglottitis? Children 2 months and over should receive H. Influenzae B vaccine. 73. What position will a patient with epiglottitis be in? 74. How is the diagnosis for epiglottitis made? 75. What can happen if you use a tongue blade on a patient with epiglottitis? Laryngospasm, therefore, you should never use it. 76. What makes the definitive diagnosis? Laryngoscope (done in adults only). Thank you so much for using our Epiglottitis practice questions to learns, study, and strengthen your respiratory knowledge. I truly hope that this study guide was helpful for you, and I’m confident that if you use if properly, it will be. I wish you the best of luck on your journey to becoming a Registered Respiratory Therapist and as always, breathe easy my friend.